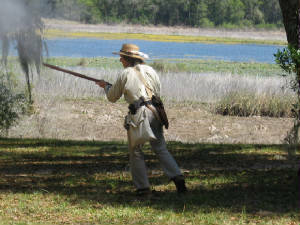 Interested in Seminole War Reenacting, or the period in general? Contact the officers of the Florida Frontier Guard given below for more information on Seminole War reenacting, and how to engage in Seminole War reenactment events. Contact Captain Nipper at Militiacapt@yahoo.com for more information. Charge! Eric Esenwein at Fort Cooper, 2007.